In November, Jakub Bochinski gave a wonderful and very popular lecture titled “From pole to pole-a short tale of extrasolar planets & how we find them”. Last year Jakub gave a very informative, interesting & well received lecture introducing exoplanets. He is currently working at the Open University researching exoplanets. Jakub gave a brief description explaining what exoplanets are & that the first exoplant was found in 1992 by Alexander Wolzczan. He explained that there are currently 974 confirmed exoplants and thousands of candidates, showing graphs and diagrams to explain this. Jakub has co authorised some of the most recently discovered exoplanets and has starting looking into exogiant galaxies. He went on to explain how habitable these planets maybe for life, the size of the planet and what it is made of. He explained the methods used to find exoplanets which are: Pulsar timing, Radical velocity, Eclipse timing, Micro gravitational lensing and Transit searching. Transit searching is the method which has led to the discovery of the most exoplanets. He makes his observations using data obtained from the Superwasp telescopes and by following possible leads up with the automated pirate telescope. He finished by telling us about future missions using the ‘Tess’ satellite and the ‘James Webb telescope’. After appreciative applause he went onto judge the photographic competition. Members and guests enjoyed our Night Under the Stars event on Friday 13th and Saturday 14th September 2013. Unfortunately the weather was not kind to us on the Friday; in fact it hammered down with rain. Three brave people braved it though and were able to have a look at the display boards and talk to those members who had come along to help. Saturday fared much better and although not perfect seeing conditions, it was clear enough to enable us to open the observatory and set up several telescopes on the lawn. About 80 people - members, guests and children from Woodrow House turned up and were able to view various astronomical objects. Neil and Jane from Tring Astro were also on hand with a display of equipment for our visitors to look at and to offer advice on the various 'scopes available. On the back of the BBC’s, now annual, Stargazing Live broadcasts, Wycombe Astronomical Society held two Star Party’s to mark the event. Held on Friday the 11th and Saturday the 12th of January, just a few days after the actual event, both star party’s were extremely popular and we calculated that we must have had about 120 people turn up over the two evenings. Woodrow House kindly provided us with a marquee in which we could demonstrate the various telescopes and talk to the visitors. The observatory was opened up and a constant stream of adults and children queued up to take a peek through the society ‘scope. Various members set their telescopes up on the grounds around the observatory and this provided a lot of opportunity for our visitors. Unfortunately, as is often the case with these events, the weather was not on our side. It was damp, cold and foggy for most of the evening and the best part of 90% of the sky had cloud cover. That said Jupiter did an amazing job of remaining visible at all times (well nearly most of the time) and this provided our visitors with an interesting object to look at. The seeing was remarkably good and Jupiter’s bands and moons were clearly visible. 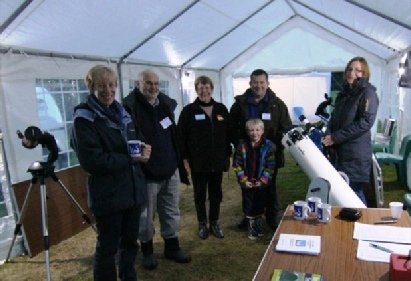 Thanks must go to Morton for arranging the event, Woodrow for the loan of the Marquee, Brian for manning the observatory on both evenings, Neil for bringing a range of observing equipment for visitors to look at and to our many members who brought their ‘scopes and gave up their time to help with the event. 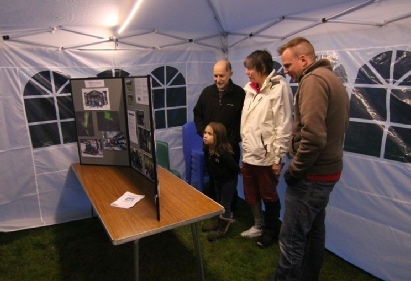 Continuing on from Stargazing Live, the first meeting of the New Year was our annual telescope evening. 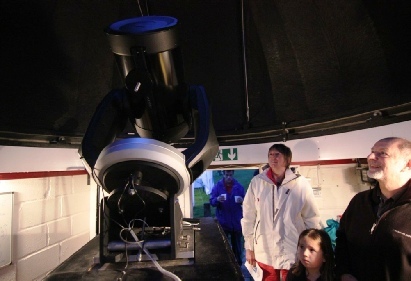 This again proved to be a popular event and many of the visitors who had come to our Stargazing Live event came along to our telescope evening. Many members brought their equipment to show off and we had a great range of Schmitt-Cass, Reflector and refractor ‘scopes on display. A Dobsonian was also part of the mix this year making it a “full house” of ‘scope varieties. Although very cold and icy the sky was particularly clear that evening (for a fair proportion of the evening anyway) and for those that had set their ‘scopes up outside great views could be had of Jupiter and Orion. Our next practical meeting will be on the 7th of February and is on the basics of taking pictures with a webcam and the main meeting will be held on February the 20th and is on the Northern Lights. The 2013 photographic competition will start at this meeting so do bring along your astro photos and give it a go.